Plymouth Argyle manager Derek Adams says his squad for this season is almost complete. The new Argyle boss has made five permanent signings and loaned in Crystal Palace youngster Hiram Boateng. "There won't be many more loan signings I can guarantee that," said Adams. "It'll be one or two, that'll be the maximum. You always want more, but you can only work within your parameters - and the parameters that I've been given I've worked within," he told BBC Sport. Earlier this month Adams told BBC Sport that he would not be making any more permanent additions to his squad as he works within the budget he has been set. "I've worked at another football club where it was exactly the same. 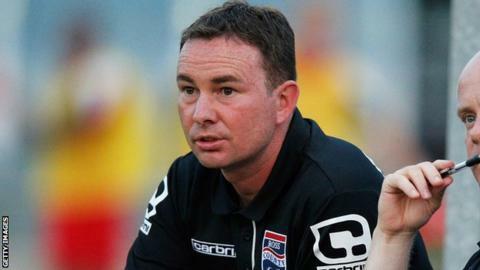 You always get people who are greedy - I'm not greedy, I just get on with what I've been given," said Adams, who joined Argyle in June having previously had two spells in charge at Ross County in Scotland. The 40-year-old also says he is almost certain of his starting line-up when he gets his first taste of English league football when Argyle travel to AFC Wimbledon on the opening day of the season. "I think I'm 99% certain of what the team's going to be," he added. "We're working towards that and we've got movement within the squad and probably got a core squad of around 15 or 16. We'll work with them and a number of young players who we're pushing in as well."